eDirectory includes a thorough search function. What's the use of all that data if your users can't find their way around it? With eDirectory, the search and filtering of said search results is included as standard. Search by list, map, proximity, or category - and when you've found your data, refine it further with a top-of-the line filter system. Our search engine is able to grow with you by constantly staying up-to-date and accurate. 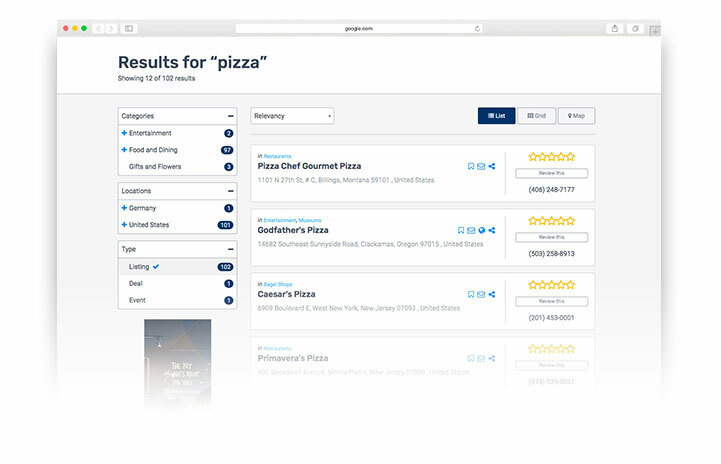 Users can filter search results to narrow down options and find exactly what they are looking for. Reporting that shows you what people are searching for, helping you identify what content is important.